Broadly speaking, the vast majority of SUV owners take advantage of the bigger wheels and increased ground clearance to hop small curbs at the local strip mall. Volkswagen will unveil a concept car named Atlas Basecamp at the 2019 New York Auto Show to prove these vehicles are capable of doing much more, especially when they’re upgraded with small but significant add-ons. The Basecamp concept started life as a humble, family-hauling Atlas, nut it was transformed into a serious overlanding rig ready to spend days off the grid by Volkswagen and a diverse selection of aftermarket companies. The modifications include a 1.5-inch lift kit, 17-inch wheels wrapped by all-terrain tires made by BF Goodrich, and LED spot lights on both ends to illuminate even the darkest, most remote trail. The Basecamp also gains a Front Runner roof rack capable of holding two mountain bikes, while a two-tone gray and black paint job with orange accents adds a finishing touch to the look. You could camp in the back of the dorm-room-sized Atlas — it’s certainly big enough — but Volkswagen teamed up with trailer manufacturer Hive to provide more comfortable sleeping quarters. The Basecamp tows an EX trailer kitted out with a queen-size bed, a kitchenette, and a shower that draws water from an integrated tank. The roof-mounted canopy turns any patch of land into a covered patio on which adventurers can sit back, relax, and enjoy a meal. And because there’s a propane-powered stove in the trailer, you’ll never be far from a cup of coffee or a medium-rare steak. The concept is based on the SEL Premium trim, so it’s fitted with a 12.3-inch, high-resolution digital instrument cluster the driver can configure using buttons on the steering wheel. The Overhead View Camera (which stitches footage from several cameras to show a 360-degree, bird’s eye view of the Atlas) comes in handy when meandering between boulders and tree stumps. 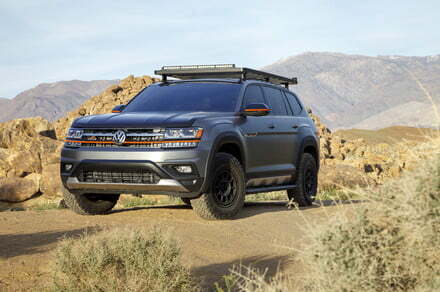 Volkswagen hasn’t made any major mechanical modifications to the Atlas Basecamp concept. It needs power to tow and climb, so it uses a 3.6-liter VR6 engine that channels 276 horsepower and 266 pound-feet of torque to the four wheels through an eight-speed automatic transmission and Volkswagen’s 4Motion all-wheel drive system. The Atlas Basecamp likely won’t join the Volkswagen portfolio as-is, but buyers who want to explore the great outdoors with a rig just like it aren’t out of luck. Nearly all of the add-ons featured on the concept are available via aftermarket vendors, or through Volkswagen dealerships. Fifteen52 will notably begin manufacturing the alloy wheels in the fall of 2019. Making a replica requires sourcing the right parts from the right places, and a little bit of elbow grease. Our advice? Add a snorkel, too.